On February 18, 2013, I spent wonderful 3 late night hours discussing, debating, conversing, laughing, reminiscing with Bhai Balbir Singh Ragi at his lavish residence in Amritsar. Clarified a lot of ‘histories’ with him and shared a lot of information with him. 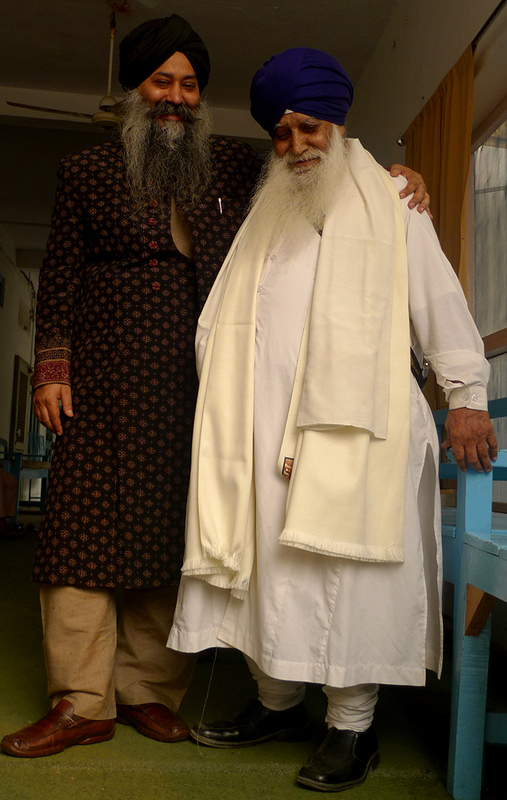 Bhai Balbir Singh and I, we have had an interesting relationship spanning over two decades now. I will never forget the first time we met in Chandigarh and told him that I am the grandnephew of Bhai Gurcharan Singh Bhai Avtar Singh – he had very lovingly embraced me then. His two brothers, Bhai Mohinder Singh and Bhai Chatar Singh, loved me more perhaps? I am still unsure —theirs was a sarcasm-less attendance to ‘me’ as compared though things are looking better these days. Thereon it was an inquisitive me, by and by learning about their music – what and how they played and what and how they sang. That they had also learnt a lot from Bhai Arjan Singh Tarangar further cemented my relationship with them – I was their – and even my granduncles’ – youngest classmate. 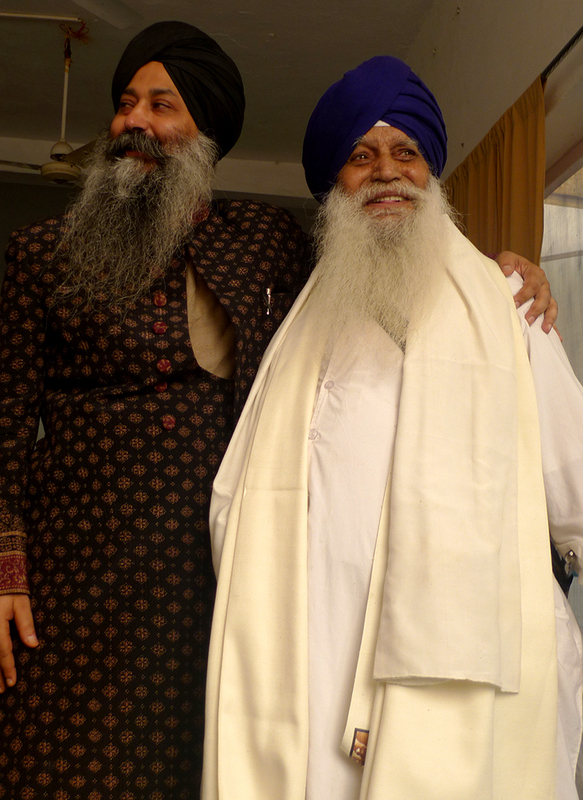 Learning from them – Bhai Balbir Singh and his percussionist brother, Bhai Mohinder Singh – was a funny experience too. One brother would share a composition but would do so with a caveat – “please do not tell my brother that I taught you this – else he will fight with me for sharing this with you..!” Both of them taught the same repertoire hiding from each other and obviously I had two separate diaries albeit with the same compositions – talk reiteration! There were issues which somehow soured our relation for long stretches of time. The main being his effort to claim me as his exclusive student. It seemed that he just couldn’t really get, until recently perhaps, that I am a book as if, co-authored by 6 maestros with small or relatively bigger contributions additionally from him plus 20 other elders; and that I will always cherish and also represent their treasures – their memories, including that of him. There was a lot that most of these elders took from me as well – it was not a one way traffic. Even the fact that I was being simultaneously hopping from one maestro to another like a bumble-bee, pollinating all who I met in my strides. In the early till mid-90s, even Fahim Sahib (fondly called Papa Saheb by me) would quote me in his interviews by adding , “jaise ki, bakaul mere bete ke…” (like, just as my son (baldeep) says…). A few years down the line, the quotes remained but the reference to me had gone. But that is alright. This problem is rampant in music where the references are lost especially when all memory is not imbibed by subsequent generations. It used to be quite embarrassing in the early years for the three brothers dealt with me as if they were dealing with my great-granduncle, Baba Jwala Singh, for they believed that I was none else but his reincarnation. Another group of people thought I was an incarnation of another maestro extraordinaire, Bhai Sahib Bhai Batan Singh of Mehli. Well, the upside was that they shared the riches they imbibed from either (and more) of these maestros, thinking they were returning back all that ‘I’ had entrusted to them before ‘I had died the last time around’. The other astonishing moments I used to be confronted with in the 90’s was when many of these ‘teachers’ of mine desired to be reborn as my ‘sons’ leaving me wondering how many would I have to father and feed 🙂 Well, they all enriched me and I am only grateful to each one of them with all my might and more. Bhai Balbir Singh had been playing strange over the last years for he would try to deny interviews to most people I sent to him including Nirinjan Kaur Khalsa, who is doing her doctoral studies at the University of Michigen. Each time I had to call and convince him – try to sensitize him of the importance of meeting the researchers and scholars for the sake of these people gaining understanding of the tradition of Gurbani Kirtan. He would eventually relent. No images were taken this evening – one for he was very casually dressed and the other, both mine and my student, Jatinder Singh’s phones on record modes respectively. I am sharing some images with Bhai Sahib though, from my visit to Nishan-e-Sikhi at Khadur Sahib at the invite of Baba Seva Singh Ji. The former Jathedar of Akal Takhat, Gyani Joginder Singh Vedanti was also present. I will always be grateful to Bhai Balbir Singh for his gracious comments that day. Bhai Balbir Singh sat intimately at the edge of the stage. Together we have laughed so much in the last 23 years of knowing of each others’ existence far out-litre-ing our fights..! I am grateful for each step we are yet to stride together —each scowl – each laugh – each debate and reasoning – begging to differ or in agreement. None of it will ever matter for he is once an elder, always an elder. I can only be proud of him..! I wonder if Dr. Jolly ever updated his writeup. If he did, that would have been scholarly but if he did not, an unfortunate myth may have been created. Sadly, Dr. Jolly died in a road accident a few years later. In any case, he should have been more academic in noting such unsubstantiated claims without subjecting them to even the simplest of scrutiny. People would have read and believed this ‘innocent’ claim. These people would have then connected with Bhai Balbir Singh on the basis of that claim. I have had problems with this group of individuals from the very beginning and when this story of asking the sons and daughters of some of the Gurbani Kirtan exponents of the 20th century for sponsoring rooms and auditoriums in the name of their ancestors was the lowest point they could stoop to. Gurnam sold the idea to Bhai Avtar Singh Ragi, a granduncle of mine, to pay up 25 lakhs or 2.5 million rupees (about 50,000 $s) in order to have the auditorium named in his father, the legendary Bhai Sahib Bhai Jwala Singh. It was like asking Mahatma Gandhi, “Gandhi Ji, the country would really love to make Raj Ghat (mausoleum) in your name but you will need to pay for it..!” He would have smiled and declined and so would have Baba Jwala Singh. He did not even allow his body to be cremated for people wanted to build a mausoleum in his memory after cremating his body. He ordered his sons and nephews to quietly offer his body to River Beas so that none of his ‘followers’ would know the place of his bodily burial. When my grandaunt Bibi Amar Kaur, wife of Bhai Avtar Singh, died and we were driving to Goindwal Sahib with her ashes that my granduncle showed me the place where his illustrious father’s body had been Beas-buried. The other ridicule in the name of music which has been done is by this allocation of the term ‘Taksal’. Somehow, Gurnam has taken upon himself the role of the ordaining people and mere music schools as ‘exponents’ and ‘Taksals’ respectively. There can be no better example of this department ordaining Bhai Balbir Singh as not only belonging to but being the head of the Tarn Taran ‘Taksal’. The uniqueness being the ending pauri and singing of Dasam Bani texts. The funny side is that anyone versed with the actual tradition of Gurubani Kirtan will tell that these virtues were that of each family or school not necessarily particular to anyone particular. While helping filling out Bhai Balbir Singh’s response form for the coveted National Sangeet Natak Akademi award, which the honorable professor (gurnam) has aspired for since the last many years, this issue of Gharana or tradition/taksal did come up. On the birth anniversary of the fourth Sikh Guru, Sri Guru Ramdas (Nanak IV), which is celebrated inside the Manji Sahib hall. This hall has a horrible audio ambiance, nevertheless. For the first time, I ended up being invited at this Gurbani Kirtan festival in which only the Bani or compositions by Nanak IV is sung. Bhai Balbir Singh was also one of the singers. I was scheduled to sing at the last while Bhai Sahib sang at the prime time, when the live telecast is relayed across the satellite world and venue is jam-packed. He reiterated the ‘story’ of how the ‘forsaken’ Rababi-s, Bhai Satta Bhai Balwanda had left the fifth guru, Sri Guru Arjan Dev (Nanak V), and that ‘his ancestors’ had sung the Kirtan with folk music instruments. One, that the historians believe that the episode of the legendary Rababi’s actually happened during the second guru, Guru Angad Dev (Nanak II) and not in the times of Nanak V. They (the historians) rely on the fact that in the ode in Ramkali by the two Rababi’s, which is included in Gurbani, the majority of the text is in honour of Nanak II, Guru Angad Dev.There was this episode of the two Rababi maestro-Kirtaniye having left the Guru’s court in a huff but had eventually realized their own error and had eventually sought forgiveness. The story of their return back to the Guru’s court is seeped in humility, grace and dignity. They are two among the other authors of Gurubani we the Sikhs, bow to in reverence. So, when the two exponents, namely, Bhai Balwand and Bhai Satta, may never have left the court of Nanak V, how could the story of anyone picking up ‘folk instruments’ be accurate. Two, if we are to believe the legendary Bhai Gurdas, the maternal uncle of Nanak V, whose odes are equally revered in the Sikh thought, when he bears ‘witness’ (in quotes for he was not actually a witness to Guru Nanak but relied on accounts from Sikhs or Nanak-panthis associated with the first guru) that each Sikh household during the first guru’s times had become an abode of Dharma (Dharmsaal) and that instruments mridang and rabab were played. Now, these instruments are not folk instruments and require considerable learning. The music of the later gurus until Nanak V was of the highest order. Just because the Gurus’ Rababi-s used to lead the singing during the main ceremonies, it would be inaccurate to imply or infer that the Sikhs who remained when the Rababi’s left, were musically illiterate. I also shared these thoughts with my respected ‘Chacha’ BHai Balbir Singh and I think he got his historic facts and values right. While filling up the form, I asked him about the samprada or gharana (school) he belonged. His answer was Gwalior gharana for he had studied from Pandit Krishna Rao. I then reminded him about his learning from my cousin, Sardar Balbir Singh Kalsi and his teacher, Padma Shri, Sardar Sohan Singh who was a disciple of Ustad Faiyyaz Khan of the Agra gharana. With a “Sure, then add that!” Bhai Balbir Singh had nodded. I then asked him about the Gurbani Kirtan repertoire of his. He said “We have our own gharana, of Tarn Taran” referring to the status ordained by the Department of Gurmat Sangeet, Punjabi University, Patiala. I asked him details about Pandit Nathu Ram’s singing style who was an extraordinary Dhrupad singer. He only remembered about the “makaaN lagaanaa” but no composition. I did correct the pronunciation of his for he was calling it mukaam but did not tell the name of Pandit Nathu Ram’s teacher, who was a junior classmate of Baba Jwala Singh, a great-granduncle of mine. So many people taught at Tarn Taran and the most important exponents to teach there belonged to the same tradition and lineages as my own. To term it now as a Taksal or a gharana is nothing less than a cruel joke on the tradition. Heard him at Adutti Sangeet Sammelan. A Pure Bliss !!! A treasure house of rare knowledge. Bhai Balbir Singh is a voice recognized in most Sikh households and indeed honored the world-over for his contribution to Gurbani Kirtan. It is interesting that while he holds an important role within Sikh devotional music, the histories surrounding this role can be at times be ‘mythologized’. This is not unique to him, but it appears that within the realm of Gurbani Kirtan much memory has been lost so histories are being reinterpreted to fit particular ideologies. This awareness or ‘demythologizing’ does not detract from their lived historical and cultural value, but simply questions the semantic and historical accuracy through which our stories are re-told. Bhai Baldeep Singh’s narrative, while honoring our elders such as Bhai Balbir Singh, also expresses the importance of scholarship to remember and appreciate the riches that the tradition does hold without unnecessarily fictionalizing them.